Chocolate milk has been making headlines for some time now about it being the “athlete’s drink.” But do you really know why? Before we dive into that too much, let’s review a little what happens when we exercise. In our bodies, protein is constantly being built and broken down. This is called protein turn-over. A side effect of an exercise bout is the breaking down of proteins. Exercise causes some tissue damage and requires a little repair. Not only do you need the protein, but your carbohydrate stores need to be replenished as well. This is why there is a recommendation to eat a carbohydrate/protein snack post-exercise. The term “recovery snack” makes more sense now, doesn’t it? So what makes chocolate milk so special? Cow’s milk is considered to be a high-quality protein because it contains all of the essential amino acids. Essential amino acids are those that are body cannot produce and must be taken in through the diet. It also contains more carbohydrates (cho) per serving when compared to regular white milk. In a study led by the University of Connecticut, they examined chocolate milk consumption with endurance athletes and how it affected protein balance, glycogen, and performance. Runners were asked to complete a 45 minutes exercise. After that, each runner was given either chocolate milk (cho+pro) or a sweetened beverage (cho only). 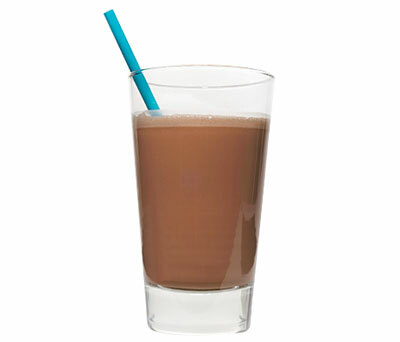 At the end of the study, they found that the runners who drank the chocolate milk had greater protein synthesis and less protein breakdown than those who drank the sweetened beverage. Both drinks were able to maintain glycogen (cho) storage. This study, along with others, show that it takes BOTH protein and carbohydrates to properly recover from exercise. Chocolate milk is a convenient (and tasty!) way to get the nutrients your body is craving. Remember- a recovery beverage should be consumed within 30 minutes of exercise to see the full effects.